CHDL series vertical ring pulse-type High Gradient Magnetic Separator is the strongest magnetic equipment with the best performance, state-of-the-art technology at home and abroad. This equipment fundamentally solved the blocking problem of horizontal ring magnetic separator & high gradient magnetic medium, with advantages of high concentration ratio, strong adaptability to feeding ore granularity, density and grade fluctuation, reliable operation, easy maintenance, etc. Achieving concentrate ore with high grade and high recovery rate by picking weak magnetic ore.
please visit https://www.youtube.com/watch?v=DeKEi0tm5v0&feature=youtu.be for onsite operation video clip. High Gradient Magnetic Separator consists of idler wheel, medium box, assembly part of up & low iron cores, excitation coils, ore feeding hopper, concentrate hopper, middle hopper, tailing hopper, concentrate flushing device and pulsation generator. Magnet conductivity stainless steel bar medium box or stainless steel mesh magnet medium pile is installed with Rotary ring(4). During mineral selection, rotary ring(4)rotates clockwise, and ore slurry will be fed from feeding hopper(6),then flowing through the circle in rotary ring along gap of upper iron yoke(5),the magnetic medium is magnetized in magnetic field, forming high gradient magnetic field in surface, magnetic particles in ore slurry are attracted to the surface of magnetic medium, rotary ring(4)takes it to the top of nonmagnetic field area, and then washed into concentrate hopper by flushing water of concentrate flusher(12),nonmagnetic particles via inner annulus to outer annulus flow into tailings hopper(10) along gap of bottom iron yoke(2)and then discharged. * High gradient magnetic separator adopts vertical ring rotation, reverse flushing the ore. CHDL series separators adopt the vertical ring rotation type, for each group of magnetic medium, the direction of reverse flushing is opposite to the feeding direction, and the coarse particles can be flushed out by water without passing through the magnetic medium pile. Thereby it effectively avoids magnetic mediums blocking. * Using ore slurry pulsing mechanism to drive ore slurry to generate pulsating hydro-force. Under the action of pulsating hydro-force, the mineral granules in the slurry are always scattered, which improves the quality of magnetic concentrate. * Horizontal ring magnetic separator has strict requirements to the feeding particle granularity. We designed the unique magnetic system structure &optimized combination of magnetic medium which raises the upper limit of mineral grain size up to 2.0mm, simplifies the mineral grading work and increased adaptability of separator. * High magnetic field strength, the background magnetic field is up to 1.3T, the surface magnetic field of medium box is up to 2.6T. * Due to the special design of the medium box, magnetic field can generate high gradient magnetic field within high density and disorderly bars medium structure. According to attractive force formula of magnetic field to material F=K×X×B×ΔH×V, which illustrates high gradient magnetic field makes it easier to attract paramagnetic mine. F:attractive force; K: coefficient; X: specific susceptibility; B: flux density; ΔH: gradient; V: materials’ volume. * Outlet box is simple, beautiful and easy connection to the site interface. * With automatic precaution function. When the cooling water pressure is insufficient or the cooling water outlet temperature is too high, the system will give sound and light to alarm, meanwhile it will automatic cut off power supply, thus service life is extended. * Technical parameters, like magnetic field, ring rotating speed, pulse box stroke & pulse box frequency all are adjustable, thus it is easy for user to finalize the optimum technical parameters. * The electrical control cabinet adopts air cooling, which is more reliable and safer. Separation of weak magnetic minerals, such as: hematite, limonite, siderite, chromite, titanic iron ore, scheelite, wolframite, manganese and tantalum-niobium ores, etc. 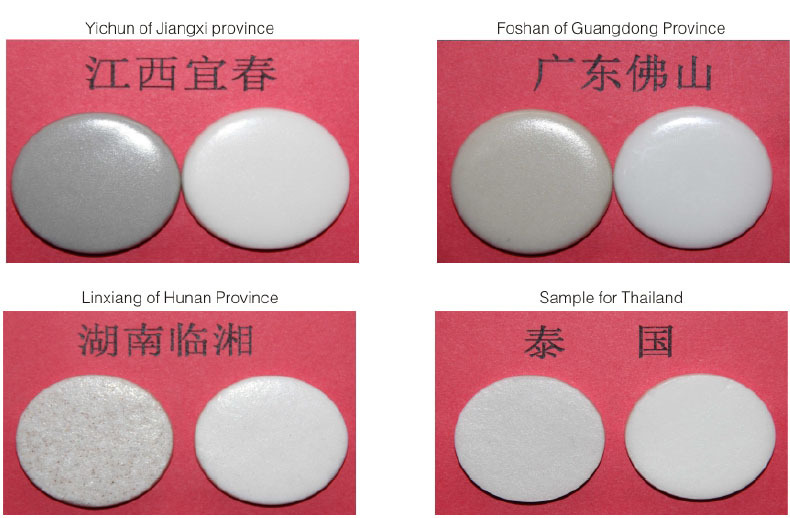 For iron separation from nonmetallic minerals, such as quartz, feldspar, nepheline, fluorite, sillimanite, spodumene and kaolin, etc. 1. Model selection principle: according to the handling capacity of ore slurry. 2. Model selection principle for dry nonmetallic minerals: handling capacity of dry ore should be half one of the above table. 3. According to the separation effect, we don’t recommend pulsating box to nonmetallic minerals selection, if needed, parts of pulsating box can be supplied. 4. In the technical parameters table, the separator weight, max.unit weight and overall diameter are parameters for separator with no pulsation box. Since the magnetic separator is a kind of separator which has requirements for materials’ particle sizes, ore slurry should be first separated by drum screen before entering the separator. Drum screen not only can be used as slag removal equipment for CHDL vertical ring magnetic separator, but also be used in metallurgy, mining, chemical abrasive and other industries which need slag removal equipment. ②The area of screen is big enough, it can touch materials alternately thus the service life has been prolonged. ③The screen features low noise, totally sealed structures and no dust contamination. ④The screen can be separated with different sizes thus it can be adapted to variable particle sizes products. The drum screen will rotate under the force of driving mechanism, ore slurry from the lower left part can be poured to the drum screen circle, fine particle ores and water will fall to the ore bucket through screen, and then they will flow to the CHDL magnetic separator by fine particle pipes for separation. The coarse particles will be transmitted to top by slag carrying plate and coarse particles will be flushed into the recycling hopper at last. Screen size can be customized by requirements of users. By stimulating the real beneficiation process, we design an automatic beneficiation line which consists of crushing equipment, ball grinding machine, grading, mangetic separation, flotation. Complete experiments can be done in this Lab for customers. Also by the test Lab, the test result can be analyzed instantly & accurately. In order to enhance the credibility of the data, and offer the reasonable data for actual equipment model selection & technical process, the actual production process is maximally simulated during the test process in the lab.